Auditory effects or any other health effects may develop to any person at any frequency level depending upon the individual exposure to noise situation. Low frequency noise,  up to 100 Hz may cause non-aural physiological and psychological effects below the individual hearing threshold. Leventhal et al, also emphasized that 10-200 Hz frequency noise is an environmental noise sensitive to people in their homes and offices. This is the group which generates many complaints and is generally seen to the people of middle age. It may also occur to the subjects working in industry, but generally found at levels well above threshold. Similarly, low frequency noise  produced by the armoured vehicle also causes negative effects on reaction time to the normal hearing subjects. Pal et al, have investigated that dozer, dumper, screen plant and pit exhaust fan generate noise in the alarming frequency range of 250-500 Hz. Similarly, haulage machine generates noise at dominating frequency of 1.6 kHz. When spectral noise  level of 50 dB SPL is applied at the mid-frequencies, viz., 1 and 3 kHz to the exposed subjects, auditory sensitivity loss increases with decrease of loss of frequency selectivity linearly. Mahmood et al, studied that there is an increase in systolic and diastolic blood pressure to the young adults exposed to noise level of 90 dBA at 4 kHz. Subjects working in a Hydroelectric Power Plant  generally exposed to the noise levels in the range of 95-110 dBA at 2-8 kHz and hearing loss occurs within the first 10 years of exposure to noise and a dip found at 4 kHz. The subjects exposed to the high level of noise produced by aircraft and heavy machineries  exhibited notch at 6 kHz. Similarly, road traffic noise  contributes high frequency noise level of 70 dBA which causes listening interference equivalent to 3 dB. McBridge et al, investigated that intense low frequency noise may cause maximal loss over the 0.5-2 kHz range and intense high frequency noise loss at 6 or 8 kHz. Therefore, the present work aimed at to describe hearing threshold based on audiometry data of the mine workers at different working areas of an Open Cast Chromite mines. The speech frequencies and the respective sub-groups were determined using different statistical methods where the noise induced hearing loss was found to be the maximum. Audiometric data of 500 subjects (481 males and 19 females) were taken from the hospital of an open cast chromite mine of Sukinda Valley area, Odisha, India for the period 2002-2008. The data were used to evaluate a possible dip or notch at high fence i.e., at frequencies 4, 6 and 8 kHz due to exposure to different levels of noise by the subjects. The subjects were divided into four age groups, eight experience groups and five work stations as depicted in the [Table 1]. Data were entered and cleaned using SPSS version 16.0 for Windows. We describe data using means, standard deviations, frequencies and percentages where applicable. The line plot was used to depict the hearing thresholds in different frequencies for both left and right ears. The independence between workers' characteristic and hearing loss were assessed using Generalized Linear Model ANOVA, Post hoc analysis and Gabriel Multiple comparison for mean difference. Similarly, the Student's t-test and Paired t-test were used to evaluate any significant hearing loss difference between both the ears. All the results were deemed significant if P-values were less than 0.01. 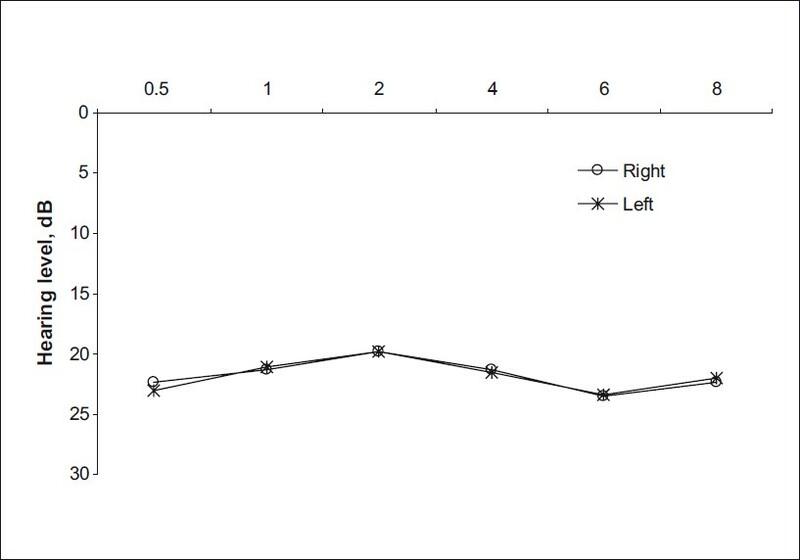 As shown in [Table 2], assuming the null hypothesis that there is no significant difference between the left and right ears with regard to hearing loss, a two tailed t-test was conducted for the whole subjects and found that both the ears do not exhibit any significant difference at 4, 6 and 8 kHz as P>0.01. Thus, asymmetric hearing loss may be attributed either in the left or the right ear at 4 kHz, 6 kHz or 8 kHz. ANOVA was performed to test any significant difference among the different age groups, experience groups and work stations with regard to hearing loss on both the ears. The most influential age group, experience group and work station were determined by Gabriel multiple comparison of mean difference. Hypothesis: Age groups, years of experience and work stations are independent for hearing loss at high fence. The hypothesis is rejected at 1% level of significance as P<0.01. Hence, concluded that the hearing loss is not homogeneous at high fence with respect to age, experience and work station. [Figure 1] exhibits the variation of mean hearing loss of the whole subjects with respect to all the test frequencies (0.5, 1, 2, 4, 6 and 8 kHz). The audiogram indicates a bilateral, no hearing loss below low fence (0.5, 1 and 2 kHz) and then moderate flat sloping mild hearing loss from 2 to 6 kHz, a notch at 6 kHz and then slight recovery at 8 kHz. The audiogram does not exhibit any "notch" at 4 kHz that is generally found due to noise induced hearing loss but shows little "dip" at 6 kHz. Thus, asymmetric hearing loss may be attributed in either of the ear. As exhibited in [Table 3], the Post hoc analysis of multiple comparisons of means by Gabriel method reveals that the test frequencies 4 and 6 kHz are found to be the most significant test frequencies for right and left ears, respectively, indicative of maximum noise induced hearing loss at 1% level of significance with respect to age and work station. Similarly, the Post hoc analysis of multiple comparisons of means by Gabriel method reveals that the test frequency 4 kHz is found to be the most influential for both the ears, indicative of maximum noise induced hearing loss in other words a deep at 1% level of significance with respect to experience. The post hoc analysis also reveals that the age group 50-60 years is the most influential age group suffering significant hearing loss on both the ears. Also, the Work Zone area is found to be most significant area affecting hearing loss on both the ears. However, the subjects having experience of 30-35 and 25-30 years have the most significant loss on the left and right ears, respectively. From [Table 3], the Post hoc analysis of multiple comparisons of means by Gabriel method reveals that the age group of 50-60 years is the most significant age group affected hearing loss at high fence on both left and right ears separately. Ertem et al, identified the first hearing loss at the age of 45 years or more to the textile workers. However, Kim et al, found that the hearing loss attributed to age starts after 65 years of age or more. But, the present work, it has been found the age group 50-60 year as the most significant group at 4 and 6 kHz and may be assigned these values as the occurrence of a dip or notch and attributed to the possibility of the sensitivity of both the ears at the earlier stage. This asymmetry  may be caused due to the presence of a subgroup (operators of the HEMMs) who generally exposed to higher noise level i.e. more acoustic energy of the sound reaching in the right ear ,, than to the left ear. Frank  investigated that 90% of workers attained hearing loss by the age of 50 years as confirmed with the present study. Similarly, Johansson et al, found that hearing threshold levels starts more rapidly in the 50 year age group for frequencies more than 3 kHz. Similarly, there exists a significant difference among the various work stations and the work zone is the most significant work station to have hearing loss at different frequency levels at 1% level of significance. Since, the most significant frequency is 4 kHz for both right and left ears, paired t-test was conducted to evaluate whether there is any significant difference exists between the right and left ears of the subjects with reference to experience. With Paired t-test, P-value is found to be 0.982 (P>0.01) and it may be said that there is no significant difference in hearing loss for both the ears at 4 kHz at 1% level of significance. The hearing loss is found to be at 6 kHz, thus the working areas of the subjects working at work zone should be regularly rotated in less noisy areas to reduce the exposure duration. High frequency noise protective device should be advocated among all the subjects in general and HEMMs operators in particulars. Regular audiometry test of all the subjects should be performed to identify the hearing loss of the subjects occurring at 6 kHz. It is essential to perform periodic maintenance of all the HEMMs to keep all the vehicles in good condition those are generating noise at dominating frequency of 4 and 6 kHz. 1. Schust M. Effects of low frequency noise upto 100 Hz. Noise Health 2004;6:73-85. 2. Leventhal G, Pelmear P, Benton S. A review of published research on low frequency noise effects. Published by the Department for Environment, Food and Rural Affairs, London, UK; 2003. 3. Nakashima A, Abel SM, Duncan M, Smith D. Hearing, communication and cognition in low-frequency noise from armored vehicles. Noise Health 2007;9:35-41. 4. Laroche C, Hetu R, Quoc HT, Josserand B, Glasberg B. Frequency selectivity in workers with noise-induced hearing loss. Hearing Res 1992;64:61-72. 5. Pal AK, Saxena NC. Development of noise indices for coal mining complexes. An ENVIS Monograph No.6, Centre of Mining Environment, Indian School of Mines, Dhanbad, India; 2000. p.24-43. 6. Mahmood R, Khan GJ, Alam S, Safi AJ, Salahuddin, Amin-ul-Haq. Effects of 90 decibel noise of 4000 hertz on blood pressure in young adults. J Ayub Med Coll Abbottabad 2004;16:30-33. 7. Celik O, Yalcin S, Ozturk A. Hearing parameters in noise exposed industrial workers. Auris Nasus Larynx 1998;25:369-75. 8. McBridge DI, Williams S. Audiometric notch as a sign of noise induced hearing loss. J Occup Environ Med 2001;58:46-51. 9. Satish, Kashyap RC. Significance of 6 kHz in noise induced hearing loss in Indian Air Force Personnel. Indian J of Aero Med 2008;52:15-20. 10. Ishiyama T, Hashimoto T. The impact of sound quality on annoyance caused by road traffic noise: An influence of frequency spectra on annoyance. Japan Soc of Auto Eng Rev 2000;21:225-230. 11. Ertem M, Ilcin E, Meric F. Noise Induced Hearing Loss among Cotton Textile and Carpet Mill Workers. Turkish J Med Sci 1998;28:561-65. 12. Kim H-N, Kim SG, Lee H-K, Ohrr H, Moon S-K, Chi J, et al. Incidence of Presbycusis of Korean Populations in Seoul, Kyunggi and Kangwon provinces. J Korean Med Sci 2000;15:580-4. 13. Backus BC and Williamon A. Evidence of noise-induced hearing loss among orchestral musicians. International Symposium on Performance Science, Published by the AEC, Auckland, New Zealand;2009. p.225-230. 14. McBridge DI, Williams S. Audiometric notch as a sign of noise induced hearing loss. J Occup Environ Med 2001;58:46-51. 15. Royster JD, Royster LH, Killion MC. Sound exposure and hearing threshold of Symphony orchestra musicians. J Acoust Soc of Am 1991;89:2793-03. 16. Frank JR. Analysis of audiograms of a large cohort of noise-exposed mines. Internal Report National Institute for Occupational Safety and Health, Cincinnati, OH;1996. p.3-8. 17. Johansson M, Arlinger S. Reference data for evaluation of occupationally noise-induced hearing loss. Noise Health 2004;6:35-41. 18. Yildirim I, Kilinc M, Okur E, Inanc TF, Kilic MA, Kurutas EB, et al. The effects of noise on hearing and oxidative stress in textile workers. Ind Health 2007;45:743-9. 19. Scheiblechner H. The Validity of the 'Energy Principle' for Noise-Induced Hearing Loss. Audiology 1947;13:93-111. 20. Fernandes SV. Asymmetric hearing loss in industry. ANZ J Surg 2010;80:480-2. 21. Coles RR, Burns W, King PF. Assessment of hearing disability: Discussion paper. J Royal Soc Med 1983;76:1032-37. 22. Atchariyasathian V, Chayarpham S, Saekhow S. Evaluation of Noise-Induced Hearing Loss with Audiometer and Distortion Product Otoacoustic Emissions. J Med Assoc Thailand 2008;9:1066-71. 23. Roozbahani MM, Nassiri P, Shalkouhi P. Risk Assessment of workers exposed to noise pollution in a textile plant. Int J Environ Sci Tech 2009;6:591-6. 24. McDermott H, Baldwin D, Nyffeler M. The importance of perpetual bandwidth and how frequency compression extends it. Hearing J 2010;63:34-40. 25. Krishnamurti S. Sensorineural Hearing Loss Associated with Occupational Noise Exposure: Effects of Age-Corrections. Int J Environ Res Pub Health 2009;6:889-99. 26. French NR, Steinberg JC. Factors governing the intelligibility of speech sounds. J Acoust Soc Am 1947;19:90-119. 27. Denes PB. On the Statistics of Spoken English. Acoust Soc Am J 1963;35:892-904. 28. Rodman J. The effect of Bandwidth on speech intelligibility. POLYCOM 2006;1-9.